It seems that self-promotion is now part and parcel of being a writer, whether self or traditionally published. But where should the line be drawn? Discovering that Marcel Proust, the creator of the iconic In Search of Lost Time, cunningly wrote a critic’s review citing the first volume Swann’s Way as a ‘little masterpiece … almost too luminous for the eye’ will hardly shock anyone in the business today. Proust was just ahead of his time. Authors are bombarded with advice on how to promote their books, especially on social media. While it isn’t ever suggested that posting fake reviews of their own work is a good idea, the advice to authors is relentless, even ruthless, enough. There is no room for shrinking violets in this game. Readers certainly like to be informed about a new book by an author but they may well begin to feel annoyed and manipulated if the chasing is too hard-boiled. Like ‘an insane cuckoo clock’ was the expression describing it that caught my eye when researching the subject on the internet. Is this what marketing on social media can turn into? The last thing many writers feel like being part of. But I can feel Proust egging me on. Maybe not to write a lyrical review about a ‘little masterpiece’ of my own, but to point to a couple of prize-winning short stories in ninevoices’ writings. Maggie Davies’ Till Death Do Us Part won a Henshaw Press competition and Tanya van Hasselt’s Marshmallow Truth won the subscribers ‘Changes’ competition in Writing Magazine. Whilst the writing style in the latter story is nothing like that of my two self-published novels, it was both fun and fulfilling to try something new. Thank you Writing Magazine for this encouragement. Holding your published novel in your hands for the very first time is supposed to be a thrilling moment for an author. But the thrill is shot through with a brimming dose of alarm. Some authors may be immune from the quaking fear that their book is, after all, a muddled affair, full of mistakes and should never have got itself printed. Learning that Mary Stewart, that brilliant writer of romantic thrillers, burst into tears when her first novel was published (see September’s post ‘Her publishers refused to pulp it’) is a great comfort. She can’t have worried about mistakes or the quality of her writing – her novels were published by Hodder & Stoughton – but even the validation of a traditional publisher wasn’t enough to overcome her dread of being exposed. With self-publishing, the unnerving sensation of ‘putting oneself out there’ is inevitably more intense. However much valuable feedback is offered by a helpful and talented writing group, this is not the same as the confidence-giving validation of an agent and traditional publishing house. Thoughts that belong to two o’clock in the morning creep into the mind: might sympathetic, friendly groups become deluded, thinking members’ work is better than it is? 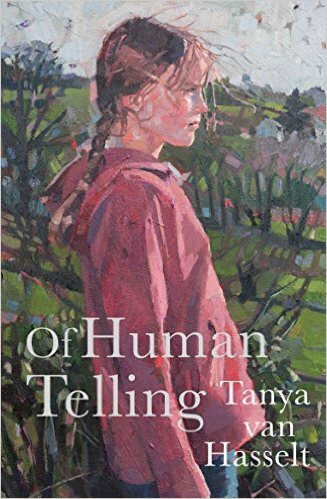 But I am still glad I have taken the plunge to self-publish my second novel Of Human Telling. I hope that it is at least good in parts, like the curate’s egg, and brings pleasure to its readers. It certainly looks and feels as nice as All Desires Known. People might even like to buy it for the cover alone, with its beautiful painting by London artist Anne-Marie Butlin. Mary Stewart, that wonderful author of romantic suspense novels with exotic settings and a literary flavour, would have been a hundred years old on 17th September. But at a time when authors apparently have to be super-confident and go about endlessly promoting their work, it’s especially endearing to read that when she saw her first novel Madam, Will You Talk? in proof form in 1954 she asked her publishers not to go ahead. ‘It felt like walking naked down the street,’ she said. Thankfully her publishers refused to pulp it. She never had an agent – her first novel was a direct submission – and she stayed with Hodder & Stoughton all her life. It’s more than 40 years since Nine Coaches Waiting, the story of a girl hired to be governess to a small boy heir to a chateau in France for sinister reasons, was read aloud to me at boarding school. It might have been chosen because of the educational value of the quotes from poets and playwrights adorning the start of each chapter, but we were all enthralled by the enigmatic hero Raoul. For Mary Stewart didn’t just give us heroines we long to be like; she gave us heroes with whom we will always remain in love. We can all learn how to do what we do, better – writers included. I spent last Saturday at the Bloomsbury Publishing offices in London’s Bedford Square. Bloomsbury Publishing, in concert with the Writers & Artists’ Yearbook people, offer a range of helpful workshops – How to Write Historical Fiction and Get Published being one of them. Over fifty committed writers split into workshops covering ancient, medieval and modern periods, taken by published authors in each field: Louisa Young (My Dear I Wanted To Tell you), Antony Riches, who writes the Empire series, Wounds of Honour, set in ancient Rome, and S D Sykes (about whom more below). In the afternoon, there was a keynote talk by Suzanne Dunn (The Sixth Wife and The Lady of Misrule) with a subsequent open discussion with her agent, Antony Topping. Last, but far from least, was a talk by Heather Holden-Brown of hbb Agency about what agents are looking for. She may live to regret her enthusiasm – she’s now top of my agent stalking list! My own two workshops were led by S D Sykes, who has published Plague Land (a murder mystery set in 14th century plague-ravaged England) and The Butcher Bird, which continues the story of young Oswald, who finds himself plucked from a monastery to become lord of his family estate when the heir dies unexpectedly. There was practical advice alongside hands-on exercises (ninevoices members know how I usually feel about those!). The speakers talked frankly of their personal experiences and journey to publication, but with special focus on the aspects essential to writing historical fiction – authenticity and research, finding the balance between fact and fiction, dialogue, setting, etc. Use progressive jeopardy. Big red line under that in my notebook. Although my own period – the 17th century – wasn’t specifically covered, I considered the day excellent value for money. I met engaging and committed fellow writers (what a nice bunch of people we are! 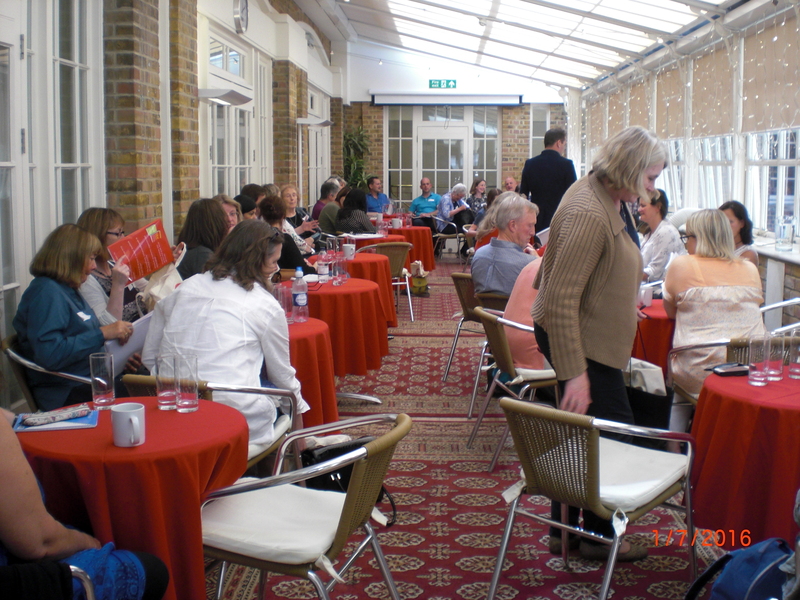 ), listened to a number of authors who’ve succeeded, and to two agents who assured us that they really do welcome approaches from new authors. It was also fun – and the white wine wasn’t bad either. This won’t be my last trip to Bedford Square. So said Ros Barber in a piece explaining why she thinks ‘self-publishing is a terrible idea for serious novelists’ in The Guardian Monday 21 March, written in reply to the recommendations to abandon traditional publishing which followed her earlier article exposing the myth of the rich writer. I enjoyed this remark; it made me laugh. I have a sausage-eating dog. But Ros Barber has certainly touched a nerve. I have just spent (wasted?) a couple of hours reading a stream of (mostly angry but also interesting, valid and instructive) comments on her piece. A free event for aspiring novelists offering an individual six-minute pitch with a literary agent from Curtis Brown or Conville & Walsh, followed by a question and answer session in a small group – this was something not to be missed. On Saturday 27th February what looked like thousands of hopeful authors poured into Foyles in Charing Cross Road, London – including two members of ninevoices. What we learned from our six minute pitch would need another post, but here are some of the sometimes surprising replies from the agent leading one of the group sessions. Q: What makes you as an agent take on an author? A: An original idea, well delivered. I am looking for a great hook, a really strong hook, that as an agent I can use to promote a manuscript to an editor . Q: Does a story need to be ‘perfect’ before I submit it? A: No. There are some books that that I will work on for the best part of a year before it is ready to be sent to an editor. Q: What should I write in my cover letter? A: The first paragraph should be a short blurb, such as on the back of a book. It should include something intriguing. The second paragraph should describe the type of novel. You might include for example the sort of book it would sit next to in a book shop. In the third paragraph tell me why you have picked me to send it to! And then the last paragraph should tell me something about you. Q: How long should my manuscript be? A: 80,000 to 120,000 words. Q: How long should my synopsis be? A: Ideally, one page, though it could run to two pages. Q: Should I tell you the ending in the synopsis? A: If you have got a really good ending, a really big twist, then no, I would rather be surprised like any reader. Q: Should I use an editing school offering manuscript review before I submit it? A: Only if you feel you’d like it copy edited before sending it, but it’s not necessary. Q: Does my age matter – I am an older author? A: No it doesn’t make any difference to my decision. Q: Are you more interested in authors who use social media? What do you think about Twitter? A: If the author already has a platform on the internet, then that’s useful, but it is not a deal breaker. If you don’t use social media, it doesn’t mean we won’t consider you. If you like it and it comes naturally to you, then Twitter – but it is difficult to know if using Twitter translates into sales. Traditional promotion remains important, e.g. promoting his/her book at book-related events, talks in local bookshops, etc, and hopefully getting into some of the big book festivals, though that is usually big name authors. Q: What about the rights to the book? Can an author keep any back? A: No.The publisher won’t let you keep any rights. Literary agents: don’t waste your time? You need to get a literary agent because publishers won’t look at unagented submissions. This is what you were always told. It didn’t occur to you that things could be any different. Sometimes rejections came by return of post or same day email (suspicion: had anyone read a word of your submission?!) sometimes several months later. Or never. Or even more frustratingly, an agent once landed can spend months failing to sell your book to a publisher. A strong-minded piece in the November issue of the ever-helpful Writing Magazine comes as happy light to the weary. It overturns the old advice. In a Q & A section, it’s suggested that nowadays other routes to publication (CreateSpace, Smashwords etc) are as valid and may be more effective than the traditional one. The rewards can be instant, in both financial and publicity terms. No agent fees, and commercial publishers might come knocking at the door. In short, searching for a literary agent can be a waste of time. Get an agent and get published? Maybe not. Time was when Waterstones were less than welcoming to self-published authors wanting to launch their books. No sign of this at the Tunbridge Wells branch on Wednesday evening 9th September when a local writing group called Tunbridge Wells Writers launched a small book called Something in the Water Unreliable Biographies. It’s a sparkling collection of fictional pieces about writers, following the lives and opinions of people as diverse as Jo Brand, Vita Sackville-West, Victoria Hislop, Arthur Conan Doyle and W.H. Davies. Guests were treated to some amusing readings by the contributors and the amazing re-appearance of a Suffragette! Not surprisingly, the pile of copies on the counter being sold by friendly Waterstones staff had vanished by the end of the evening. With tickets to the event costing £3, another £2 seemed very reasonable; the book would make an ideal present for anyone with connections to Tunbridge Wells or with a quirky, literary turn of mind and a fondness for local history.